-If using a PSX/PS2 default setup controller, Shunsq's mod, Tonberry 2.04, and Seed Reborn are all you need to get going! This mod is only needed if you want a different button setup, or you aren't using Shunsq's mod! *Using the HID interface buttons is destructive to the Green Text in the game - be warned, but the green text is BARELY used, so it shouldn't interfere with gameplay. 2. Download the Controller mod above, unpack it and open the folder you need! This should work with ALL versions of SeeD Reborn! Donate to my PAYPAL to help keep these mods alive! Special thanks to NORWIN and JeMaCheHi! ALSO, Special thanks to the community for providing the feedback necessary to complete this mod! Enjoy! Leave a comment and let me know what you think. This glitch is not present in the HID version, but it's more destructive to the green text. give/take. You are quite welcome. I was sick of trying to do the Timber Owl's Train mission without this mod. Thanks Mcindus!! This is the mod I was waiting for. Your mods keep urging me too finish my twelvehundredth playthrough of the game! Haha, nice! Thanks! That's why I do what I do! It's always nice to know people are enjoying my work! Would you mind doing original PSX buttons? I use a ps3 controller but love your mod. Is the PSX version posted not the original buttons? Or did you just miss that part of the OP? Missed it. Sorry! this is why you shouldn't post when sick haha. I have followed all instructions, I installed Tonberry and Seed. It is still showing as B1 B2 B3 etc. Please help!!! After you installed Tonberry and Seed, did you then overwrite the sysfld01_17.png and sysfld00_17.png files from the Xbox/PSX Download link? Next question - did you update hash1map.csv from the Tonberry main page? Last question: are you using the English version of the game? If not, you can still use this mod, you just need different hashcodes available on the SeeD Reborn thread. You have to have the updated hash1map from Omzy's Tonberry page or the MCINDUS Hashmap v2.1 from HorizonPack v2.1 to use this mod. First off, thank you for the quick reply. I replaced the SYfolder with the PSX link as well as the 4 hashmaps from the hashmaps link. I am playing the English version bought off Steam. Make sure you're not using SweetFX along with Tonberry. Also - make sure the MOST recent hashmap file is from MCINDUS Hashmap v2.1. 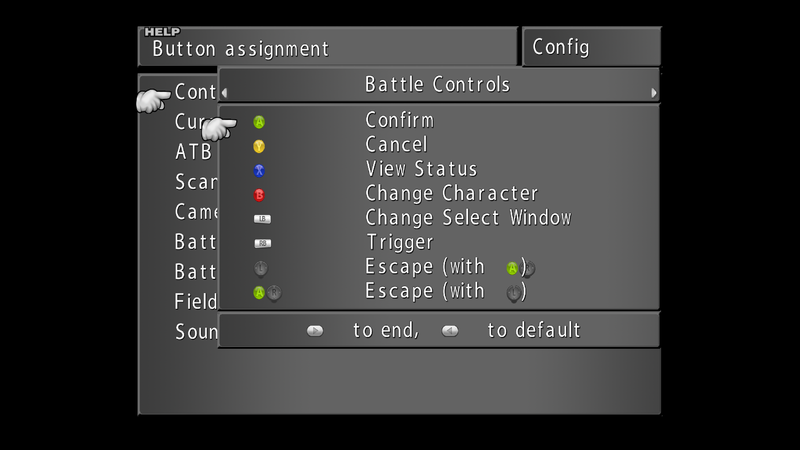 Could you post a screenshot of your controller configuration window from within the menu? That would help me figure out whats going on. Also - could you post a screenshot of your FINAL FANTASY VIII folder from within "/steamapps/common/FINAL FANTASY VIII/"? Last question: Is your OS disk on the C drive? If not, you will need to change it to whatever letter it IS on in the prefs.txt file within the "tonberry" folder in "/steamapps/common/FINAL FANTASY VIII/tonberry/"
Yea so I cannot get the button icons shown on screen to match up to what its actually on the controller. I've spent over an hour trying to figure this out. A quick write up could help, unless I getting something wrong. The icon for "X" is showing up as "Triangle", "Circle" seems to be correct, "Square" is basically not used. Thats all I have discovered so far. I am running DS4Windows with my PS4 controller plugged in. Give me a day or two and I'll have a release for you. You are a mod god! There you go! Download in the main post for PSX and Xbox buttons for use with DS4Windows, Xpadder, Pinnacle, ControllerMate, whatever. These HID links are for anyone who maps their controller instead of using the default setup. EDIT I totally screwed up the file naming in the first release. Please re-download to use the REAL version! sorry guys! So for anything use DS4, inorder for the buttons to show up correctly with your controller, you have to map your "X" button to x key, "Square" to s key, "Triangle" to c key, and "Circle" to v key. Still working on the green B1, B2, B3, B4 to not show up. Yeah, those are default keyboard keys - so if you map to the normal keyboard keys, it should work great. Just look in the keyboard configuration in the launcher and copy the keybinds. If you plug in your controller after you start the launcher, it might fix the problem. If not, there's a workaround on the forums somewhere... if you go to the Steam forums, you can find a guide for AutoHotKey for FF8 where a guy explains how to turn off your normal button recognition if you have to. After thinking about it... try to search your computer for the ff8input.cfg file and change all of the joystick button assignments (like B1, B2, B3, etc) into blanks.. then make the file read only. i think thats the fix. I found that ff8input.cfg file you were talking about. I removed all the B1, B2 etc button assignments but they are still showing in game.